At the final Transportation and Infrastructure Subcommittee meeting on Oct. 26, disagreements were in evidence over water and sewer policy and transportation options. 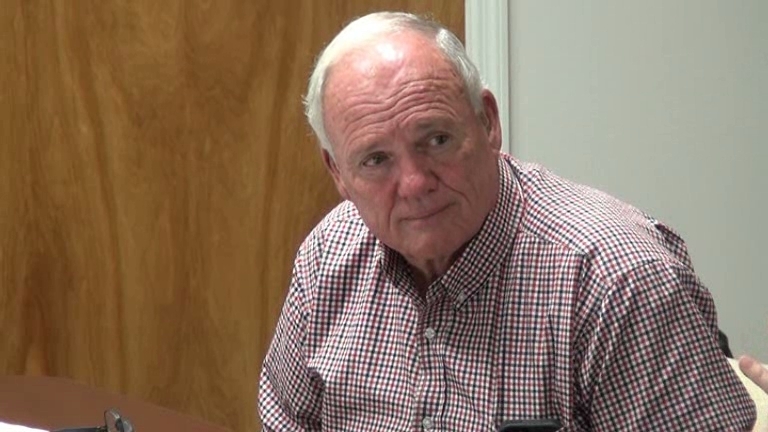 Land owner and developer Bob Bishop pushed for a statement in the 2018 Comprehensive Plan in favor of a U.S. 441 bypass on the eastern side of Bishop, but Crighton pushed back, saying he didn’t want to weigh in on that issue in the Plan. Bishop and other pro-development voices on the citizen committee have been advocating for a disbursement of development around the county, and many slow-development voices have joined them out of frustration with the congestion and lack of greenspace on the Epps Bridge Road commercial corridor. Were this recommendation on spreading water and sewer around the county to make it into the Comprehensive Plan, it would counter long-standing county policy of using water and sewer as a way of concentrating development and preserving the rural nature of the south of the county. At the Land Use Subcommittee meeting on Oct. 17, Crighton proposed collapsing the character areas, key descriptors in the current Comprehensive Plan, to three large clusters: agriculture and conservation, residential, and commercial activity and industry. Five of the 15 members of the Land Use Subcommittee attended the meeting of that group on Oct. 17. The meeting, and others of the subcommittees, took place at the meeting room in the Government Annex on the south side of Watkinsville. Maria Caudill, who is not listed as a member of the Land Use Subcommittee but is a member of the parent 29-person Stakeholders Committee for the Plan, attended as well. Crighton proposed that the new Plan name Eastville and Farmington as country crossroads and places suitable for a type of future development. Both Farmington and Eastville were incorporated as cities at one time in the past, but neither is today. Farmington is in the far south of the county on U.S. 441, while Eastville is at the intersection of Hodges Mill Road and Malcom Bridge Road just north of Hog Mountain Road. Some activity already exists in these communities “that draws people in,” Crighton said, so they are a logical place for future development. Subcommittee member Charles Hunt, who also is on the Transportation and Infrastructure Subcommittee, said the county could use these communities as examples and create other similar development centers around the county in the future. Crighton also proposed that the Plan encourage multi-family housing in Watkinsville and Bogart but discourage it throughout most of the remainder of the county. He also said that the area around Hog Mountain Road and U.S. 78 should be shown as an area of future commercial development. The meeting of the Parks, Recreation and Greenspace Subcommittee on Oct. 19 was short, with only one of the six subcommittee members, Laura Iyer, attending. Crighton ran a list of proposals past Iyer, who supported their inclusion in the recommendations that go forward to the Steering Committee at 6:30 p.m. on Nov. 20 at the Community Center in Oconee Veterans Park. Those recommendations are the key part of the draft document Crighton is shaping. Included on the list is expansion of the tennis complex at Oconee Veterans Park, establishing a historic village at Heritage Park, and adding other facilities at Heritage Park, the county's least developed recreational facility. The list also included a call for a master plan for county parks and development of a plan for multi-use trails to connect greenspaces, parks and other trail networks within the county and region. Seven of the 12 members of the Transportation and Infrastructure subcommittee attended the meeting on Thursday night, including Iyer. Caudill from the full Stakeholders Committee also was in attendance. Discussion of sewers dominated the meeting. Dave Jackson, who is on both the Land Use Subcommittee and on the Transportation and Infrastructure Subcommittee, told Crighton that he would not support inclusion of any map for the county’s wastewater system that shows a pipeline down Calls Creek. Jackson lives in the neighborhood along the creek and has been active in opposing that proposed pipeline. Bob Bishop, who owns land around the county, has not been shy in presenting his views both on the Transportation and Infrastructure subcommittee, where he is a member, and at the full meetings of the Stakeholders Committee. 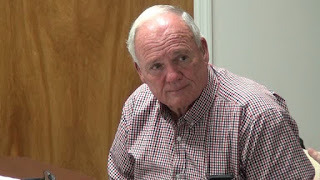 Bishop is retired from the Georgia Environment Protection Division, and he responded at length to Jackson’s comments about sewers. During one 15 minute and 10 second period in the second half of the Subcommittee meeting on Oct. 26, he talked for 10 minutes and 21 second, with one stretch of 4 minutes and 40 second uninterrupted. Bishop said the Board of Commissioners should adopt a policy prohibiting residential sewer service, but he also advocated for construction of the proposed gravity-fed sewer line down Barber Creek. At present, the county is selling sewer capacity for residential development, but it has proposed a limited amount of residential sewer when the Calls Creek wasterwater plant is upgraded next year. Subcommittee members and other members of the Stakeholders Committee have commented in past meetings on congestion caused by heavy truck traffic through the county and, in particular, through Watkinsville. At the beginning of the meeting of the Transportation and Infrastructure Subcommittee on Oct. 26, Crighton asked what route the subcommittee members thought should be used to move truck traffic from SR 15 to U.S. 441 before the traffic reaches Watkinsville. Astondale Road was suggested by several committee members. That recommendation seems likely to make it into Crighton’s report. Astondale Road came up again when Bishop lobbied, without much apparent success, for inclusion of a bypass on the eastern side of Bishop in the report. The video of the Oct. 17 Land Use Subcommittee is below. Iyer begins the conversation about the character areas at 7:50 in the video. The conversation goes in a number of different directions and continues until 26:30. I was not able to attend the meeting because I was at another event, but Penny Mills did attend and recorded this video. OCO: Comprehensive Plan Land Use 10 17 17 from Lee Becker on Vimeo. The short video of the Parks, Recreation and Greenspace Subcommittee is below. Iyer, as noted, was the single member present. B.R. White and Sandy Weinel from the Oconee County Planning and Code Enforcement Department also were present, as was Jordan Shoemaker from NEGRC. Discussion of the draft of the section of the Comprehensive Plan dealing with parks, recreation and greenspace begins at 1:22 in the video. OCO: Comprehensive Plan Recreation 10 19 17 from Lee Becker on Vimeo. The video below is of the meeting of the Transportation and Infrastructure Subcommittee on Oct. 26. Crighton asked about the connector between SR 15 and US. 441 at 7:45 in the video. The discussion of sewer gets underway at 36:05 and continues until 1:08:30. Discussion of the Bishop Bypass is at 1:09:02. OCO: Comprehensive Plan Transportation Subcommittee 10 26 2017 from Lee Becker on Vimeo. Looks like a few members of the committee are very active and the rest are mainly absent. Wonder why those wanted to be on this committee? If these changes are accepted, it is the end of the rural nature of the south part of the county. For me, as a farmer, this is sad. Dr. Becker has been faithfully following the attendance record of all of these subcommittees and of the committees and whatnot. Since the percentages have been consistently poor, the good news is less hot air has been expelled on this public spectacle. While it may be required by law, the interminable study sort-of "citizen" input with attendant arguments are in fact only expensive suggestions. It has no authority; it is not law. The information details are interesting, the discussions are revealing as well as looking good on various resumes for activists, and the maps are full-color cool. Still, each and every new construction must be approved, as well as every rezone approved by the Board, which can - and will - do as it pleases. Well, there was a battle over a pipeline down Calls Creek. If they want a pipeline down Barber Creek, with many more homes and neighborhoods affected, they are going to have a WAR. If other alternatives are available (and they are) that are more expensive, pass that on to the users where they belong. Your concerns are appreciated. Since you both regularly read and comment on this blog (my thanks to Dr. Becker for publishing it), I feel there are some things that need to be said and/or corrected. 1. As residents, I welcome any feedback you have re the work we've done in JCP. 2. For me, this has nothing to do with a resume- it has EVERYTHING to do with preserving the character of Oconee County. 3. Yes, I am an activist for preserving Calls Creek, BUT- If Calls Creek is the right way to go in order to get treated wastewater to a larger river, I'll support it. I don't think it is the right way, though someone thinking ONLY about dollars might see it as the best option. I believe there is a price to be put on the natural beauty and environment in OC, and I'm not willing to pave over paradise just because the bean-counters want to have a pump-free system. 4. That doesn't translate into: Barber Creek gets destroyed instead. With insight there are plans/possibilities that can work for us all, but it will take a community fighting for it to get it worked out. I'm not going to give up trying, and I also believe that the brunt of the cost/support for this should be borne by the waste generator. 5. You seem to have a dismal view of community activism in OC. I want to tell you that you are flat wrong about that. I've seen amazing things done by small groups in this county. As a Citizens Advisory Board member of DFACS, I have seen ordinary people perform miracles, because they see a need, and they work at it until it is filled. Miracles and kindness and opportunity for compassion and care of something dear (like our county) are out there, waiting for us to seize them. 6. I will never stop fighting for something I believe in. I'll be at JCP again tonight- fighting for what the citizens of OC have clearly said in the surveys that we collected. I hope you have an opportunity to attend and hope you will introduce yourself to me.